Many people enjoy a good steak. Generally, however, they don’t want to know the details of how it goes from cow to plate - they just want it to be the best steak they’ve ever had. How do you know if the steak is any good? Well, you have a number of criteria - taste, texture, and smell to name a few. hen it comes to a lens design, however, it becomes much more difficult to figure out when you’ve gotten a “prime cut” and when you’ve gotten the meat department closeout not-technically-expired special. The ophthalmic lens industry has a wide range of designs and lenses available - I’m sure you’ve heard of quite a number of them. The quality of all of these lens products can vary significantly, however, as their underlying technology used in calculation and production can be vastly different. In the days before freeform technology, conventional progressive lens designs were made by creating a mold with the design in it. The lens material was then added to the mold to for the design on the front. Since this is a costly process, lens manufacturers only make a limited set of these designs. This is why they tend to have more limited availability in a given base curve, material, or inset. This is like going and getting a steak from a supermarket. You get to choose whatever cuts they preselect for you. If it’s not quite right, you deal with it. Freeform, on the other hand, lets you get the exact cut of meat you want. You can have any combination of add power, base curve, material, inset, corridor length, etc. Every lens surface can be customized to the specific prescription, increasing the possibilities of what can be created with traditional spherical lens blanks. So, let’s assume that you go to the effort and expense of getting ahold of a piece of top-tier steak. Whatever your ‘ideal cut’ is - we start with that. 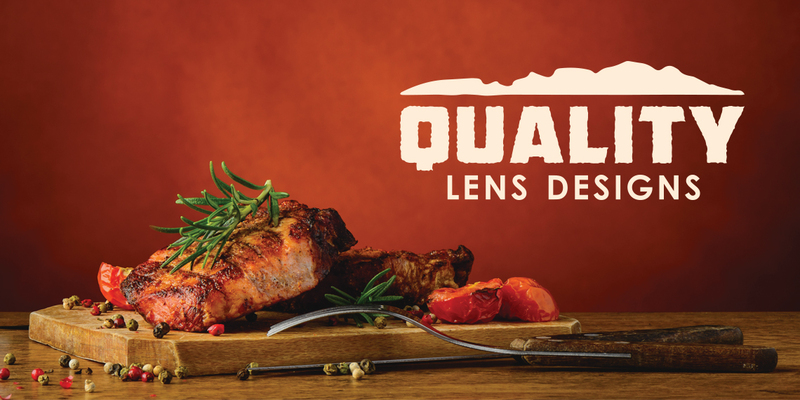 That’s our lens design - an ideal, perfect representation of what a lens (or a steak) should be. However, before you can actually sit down and enjoy it, you still have to make it. A steak has to be cooked, and a lens has to be made. Everything we do in those processes are going to affect the final outcome. For lenses, the final result is going to depend not only on the calculation technology used for the design in the first place, but also the production quality of the lab that is used to make the lens. If the lab doesn’t have a stable or well-tuned process, they aren’t going to be able to accurately produce the lens design the way it was intended to. Just like if you have a cold spot on the grill and a chef that doesn’t really understand what they are doing, you end up with a steak where one end is burnt to a crisp and the other end is still cold. The lab (or chef) is going to be the deciding factor in how close to ‘ideal’ your final product ends up being. It’s also why you need good calculation technology to begin with. If you start with cheap steak, then your final product is only ever going to be mediocre, at best. There’s no possible way to cook it and have it be ‘the best ever’. The same with lens designs - no matter how good the lab is, an inferior design will always be inferior, even if you cover it in barbeque sauce (or ketchup, if you’re one of THOSE people). As we’re talking about steak, there’s plenty of different ways to get steak - T-Bone, Porterhouse, Sirloin, etc. Everyone has a different favorite, as people have different preferences. When you are dealing with an older, molded progressive lens, you don’t get that option. You can’t pick the kind you want - you get it the way it is, and that’s it. If it’s not quite right, there’s nothing that you can really do to change it. With a freeform lens, however, it’s possible to customize each order to individual parameters to give the patient better visual performance when compared to older, conventional lenses. Personalized lenses use a digital model of how the eye moves to calculate the actual power the wearer perceives. This means that the lens can be better optimized to give the needed power across more of the lens surface. With this kind of personalization, there are two things that are corrected: how light rays reach the eye, and how the lens is tilted when the patient is wearing it. When creating a lens design with these factors in mind, it is possible to enhance the visual performance of the lens. A reduced level of unwanted astigmatism helps to give a superior performance to personalized lenses. This is a lot like if you can choose what kind of steak you want and specify how you want it cooked. You’re going to enjoy it much more than if you just get served a steak the way that the cook likes it. By using personalized lens parameters, the intermediate and near visual areas of a lens design can be increased by about 30%. These improvements in the lenses have been shown to be preferred by wearers in clinical studies. The results are even more apparent to the wearer in higher wrap frames, where the compensation is even more pronounced. When it comes to progressive lenses, you are going to have an even greater need for having more options to customize the lens design. While having a single generic choice can provide good overall performance, being able to have a family of designs that allow you to choose, based on lifestyle, will give you better results. This means that you can have a design that balances the near and distance to give a good “all purpose” lens, but also have separate designs that focus on the distance viewing area, or ones that focus on the near viewing area. This makes it possible to better match the strengths of a lens design to the daily vision needs of the person that’s wearing the lens. All of these lenses still have good ‘all around’ performance, and can all be used for daily wear, they each offer an edge in their area of focus. So the distance-focused lens would be a better choice for someone that drives a lot, or for sunwear. Conversely, a near-focused lens isn’t a “computer lens” in this context, but still an all-purpose progressive design that gives an edge to those that do a higher-than-usual amount of reading or use of digital devices. While being able to do all of these great things with lenses sound good, at the end of the day it comes down to the laboratory producing the product. Even if a lens is calculated perfectly, how good the final product is can never be better than the capabilities of the lab making it. Put another way, even if you have the best steak in the world, you aren’t going to get a good result if the chef doesn’t know what they are doing and burns it to death. As the laboratory is now manufacturing the complex surface on the back of the lens and creating the entire lens design from scratch, there are many more factors that go into making sure the design is correct. It isn’t just a matter of verifying the ANSI standard of distance and near power, and that’s it. In order to ensure the lens is correct requires validating the entire surface of the lens, not just those two points. This requires more advanced lens mapping machinery, which allows a comparison between the “ideal” and the “manufactured” surface of the lens. In order to ensure that you receive a quality product you need to ensure that your entire lens design is correct, as the patient is certainly going to be looking through the lens in more than just the one spot checked in a lensometer. Freeform lens processing gives a much higher degree of flexibility in what lenses can be created, but is only one ingredient in a successful result. You need to be able to trust that your lab has the capability to cook you up the kind of lens that you and your customer deserve.